Birney, D.S., 1969, Modern Astronomy, Allyn and Bacon, Inc. Boston, 338p. Eddy, J.A., 1979, A New Sun: The Solar Results from Skylab; Edited by R. Ise., NASA Special Publication - 402, 198p. Hudak, J., 1984, Shortwave Detection of Solar Flares; in Amateur Astronomers conducted by J. W. Briggs, Sky and Telescope, November 1984, pp 452-454. Jacobs, G., and Cohen, T.J., 1979, The Shortwave Propogation Handbook, Principles, Theory, Prediction, CQ Technical Series, CQ Publishing, Hicksville NY., 150p. Maloney, F.P., 1986, Computer CB Scanner; Computer Digest insert in Radio Electronics, v.57, n9, pp 7-9. 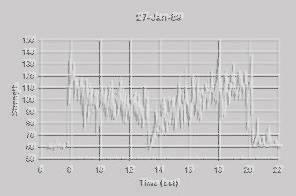 Olivier, W.L., and others, 1988, Ionosphere incoherent Scatter Measurements with the Middle and Upper Atmosphere Radar: Observations During the Large Magnetic Storm of February 6-8, 1986, Jour of Geophys. Res., v.93, n.a12, pp.14,694-14,655., Dec. 1988. Tascione, T.F., 1988, Introduction to the Space Environment; Orbit Book Co., Malarbar Florida, 116p.